ON THE SURFACE, a toothbrush seems like just another item on the grocery list, but choosing the best one for you can be tricky. There are several factors to take into account, such as bristle softness, grip feel, head size, and whether to stick with manual or go electric. That’s why we’re here to help make your selection process easier! Have you ever noticed that the toothbrushes you bring home from dentist appointments have very soft bristles? This is no accident. Hard bristles might seem like they’re better equipped to clean away plaque, but they could be damaging your teeth and gums while they’re at it. 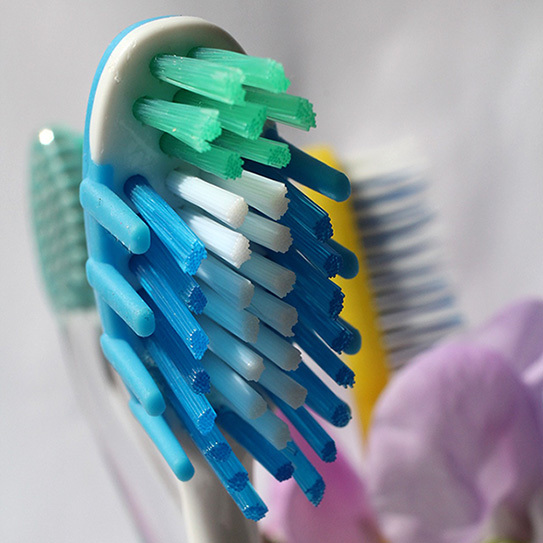 We recommend choosing a toothbrush with soft bristles. This is particularly important for anyone with sensitive teeth or gums. The next thing to look for is the size of the brush head. Mouths and teeth come in different sizes depending on age and genetics, which is why toothbrush heads have a range of sizes available. Find the toothbrush that matches the size of your mouth. Just like bristle hardness isn’t an indication of effectiveness, having more bristles doesn’t make the brush better if it won’t fit easily around your teeth. You might think that a toothbrush’s handle is its least important part, but a toothbrush with the wrong kind of handle is a difficult toothbrush to use. Is your toothbrush comfortable to hold and easy to maneuver, or does it slip in your hand? The better you are able to hold your toothbrush, the better it can clean your teeth. This is a particularly crucial consideration for people with arthritis or other conditions that make it difficult to grip objects. This is one of the biggest debates when it comes to choosing a new toothbrush. A lot of people swear by their electric brushes while others claim manual ones are better. Some electric toothbrushes can do a better job of removing plaque, but it’s up to you to decide if that is worth the greatly increased price tag. Electric toothbrushes can be particularly beneficial to orthodontic patients who have to brush around braces, people with dexterity problems, and even children! Regardless of what type of toothbrush you have, remember to always replace it between three and six months, and store it upright somewhere it can fully dry between uses. If you still have questions about what to look for in a toothbrush, just ask us! We want to make sure all our patients have the best tools for keeping their teeth healthy and clean. Put that new toothbrush to good use! San Jose Dentists Dr. Stephen Beveridge and Dr. Erin Beveridge Cabuling welcome you to Beveridge Dental. We pride ourselves in providing an environment that is Comfortable, Caring, and Comprehensive. Offering such fabulous services as One Visit Dentistry, Invisalign™ clear braces, In Office teeth whitening, One-Visit Dental Implant placement, Laser Dental Treatments, General and Cosmetic Restorative Dental Services. We are dedicated to giving you the smile of your dreams! For our neighbors in Sunnyvale, Evergreen, Edenvale, Cambrian Park, Campbell, Los Gatos, Robertsville, and surrounding areas, we look forward to serving you.